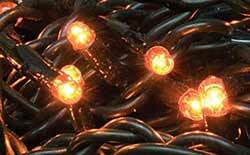 Halloween Lights & Light-up Decor - battery powered and electric string lights, light-up pumpkins, led candles, battery tea lights, night lights and more perfect for your halloween home decor or party! 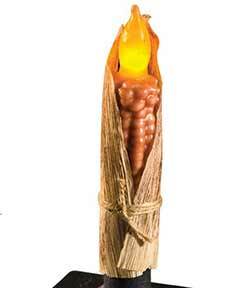 Coated with grubby black wax, this candle great for a shelf, table, or windowsill. 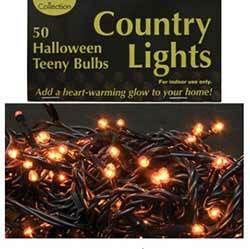 Dark color is great for everyday primitive decor, or for halloween! 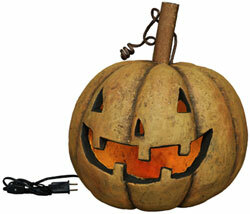 Add a touch of halloween decor to your office desk, kitchen window, or shelf with this steampunk style jack o'lantern! He's a rustic green color, with faux gears, screws, and zippers for features. 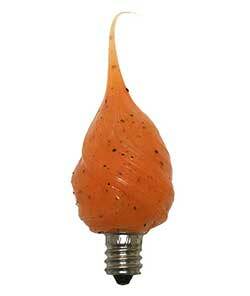 Orange Gears Light Up Mini Pumpkin, by Hanna's Handiworks. 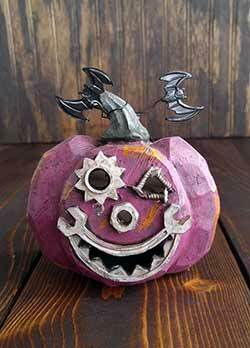 Adds a touch of halloween decor to your office desk, kitchen window, or shelf with this steampunk style jack o'lantern! He has with faux gears, screws, and zippers for features, and he lights up! Purple Gears Light Up Mini Pumpkin, by Hanna's Handiworks. 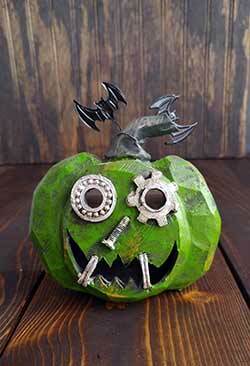 Add a touch of halloween decor to your office desk, kitchen window, or shelf with this steampunk style jack o'lantern! Painted a rustic purple, with faux gears, screws, and zippers for features. 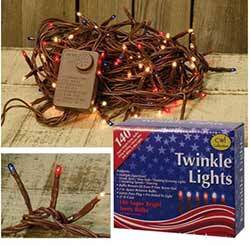 Lights up! 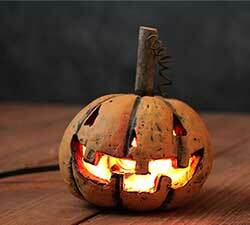 Lighted Grinning Pumpkin Head, by Primitives by Kathy. Delightfully creepy pumpkin head with wooden stem, carved face, and antiqued finish. 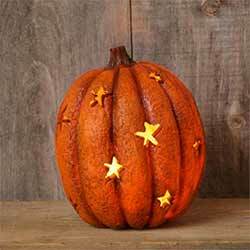 This is for the Lighted tall pumpkin. 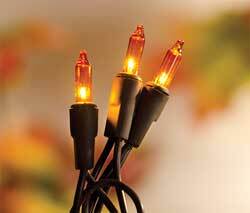 Included orange bulb and plug in piece. A Pumpkin Hollow design. Measures 10.25 inches tall. 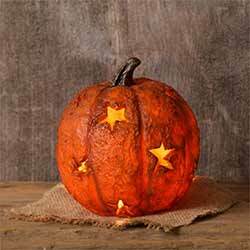 Lighted Grinning Pumpkin Head, by Primitives by Kathy. Delightfully creepy pumpkin head with curly stem, carved face, and antiqued finish. This is for the Sinister pumpkin in the Small size. Has a hole in the back for inserting a plug-in light, which is included. A Pumpkin Hollow design. Measures 5.5 inches tall. 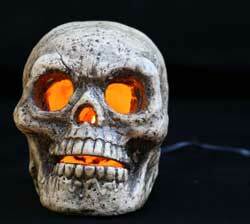 Light-up Skull Pumpkin, by Hanna's Handiworks. 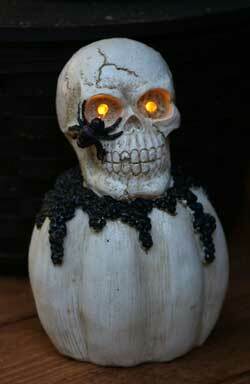 Skull figurine, white pumpkin, perfect light up halloween decor for your table, shelf, or mantel! 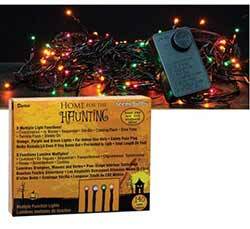 Lighted Traditional Pumpkin Head, by Primitives by Kathy. 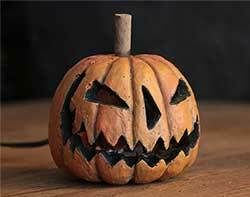 Happy grinning pumpkin head with curly stem, carved face, and rustic, rough, antiqued finish. Has a hole in the back for inserting a plug-in light, which is included. A Pumpkin Hollow design. Measures approx 7 inches tall. 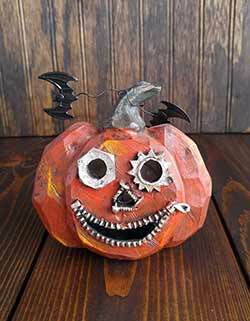 Large Lighted Traditional Pumpkin Head, by Primitives by Kathy. 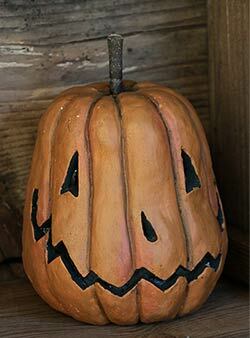 Delightfully sweet pumpkin head with curly stem, carved face, and antiqued finish. 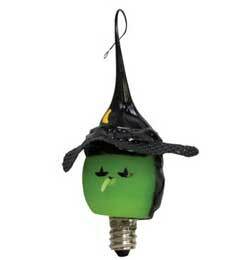 This is for the Lighted traditional pumpkin. 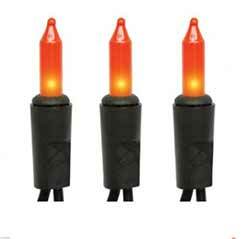 Included orange bulb and plug in piece. A Pumpkin Hollow design. Measures 9.5 inches tall.